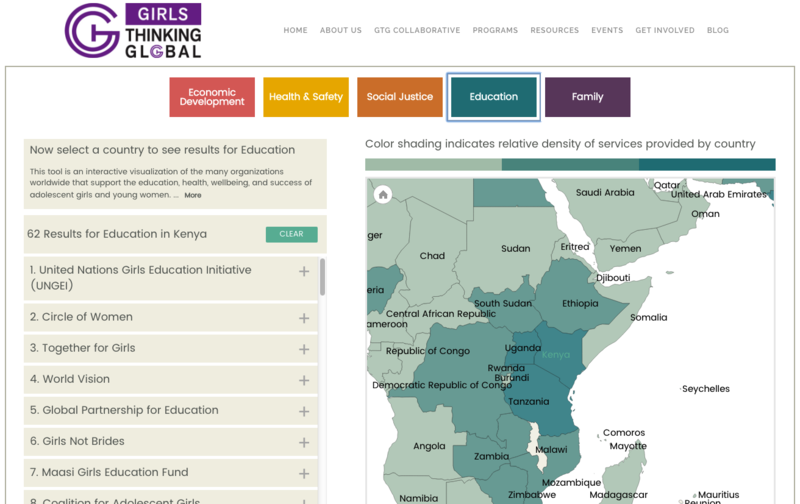 A Global Effort to Improve the Lives of Girls | Clarity Innovations, Inc.
A searchable online tool connecting agencies, foundations and NGOs from around the world, promoting partnerships and collaboration around projects for girls and young women. Girls Thinking Global was founded by five highly experienced education professionals who shared a dream. They had seen first hand the power in connection and collaboration through their work in the for-profit and non-profit sectors. They established GTG because they knew there were hundreds of organizations and thousands of people doing great work for adolescent girls, who were unable to connect. They could see that technology was the solution. Girls Thinking Global has a mission to connect and empower girls and young women, bringing together organizations offering services, foundations providing funding, and young women in need. Unfortunately, when non-profit organizations are seeking funding, it can be hard to convince donors of the worth of a large-scale project. Knowing of our work with other professional organizations, they asked Clarity Innovations to develop a way for their stakeholders to visualize their efforts globally. We consulted with them to determine which features would both provide a useful experience, and simulated how the website would work in the future. After researching our options and designing the interface, we created a tool that allows visitors to their website to connect with each other, and share resources. Compiling the data for more than 250 organizations, we built an interface that can work graphically or through text, allowing browsing and searching, by country or by service. The working prototype of the data visualization was launched in October 2016.